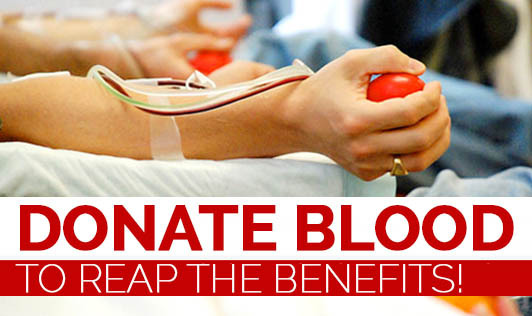 Donate Blood To Reap The Benefits! Did you know that there is more to donating blood than only saving a life? There is no substitute for human blood. And blood donation is considered to be the most priceless donation than any other donation. Everyday hospitals throughout India are challenged by a large number of people who need blood. These people might include victims of accidents, fires or other kind of emergencies. Donating blood not only helps someone in need of a life, but it also helps to optimize your own health. Isn't that surprising? Protects your heart: There are studies which show that excessive iron in the blood can cause oxidative stress leading to blocked arteries which in turn can lead to heart diseases. According to a new study published by the American Medical Association, donating blood every six months reduces the risk of heart attacks and strokes. Protects against developing cancer: The link between low cancer risk and blood donation lies in the reduction of oxidative stress. With blood donation, you reduce the number of free radicals that can damage genetic material, which is the hallmark of all cancers. Blood Analysis: Before donating, blood is tested for HIV, syphilis, Hepatitis and other factors. This can help you with identifying certain problems you may have not thought of checking. The blood will not be used if it indicates that you are sick. Any person who meets these basic requirements can donate blood. Has a blood pressure level within limits. You don't have to be a doctor to save lives. Just donate blood! And every time you donate blood you can save upto three lives.